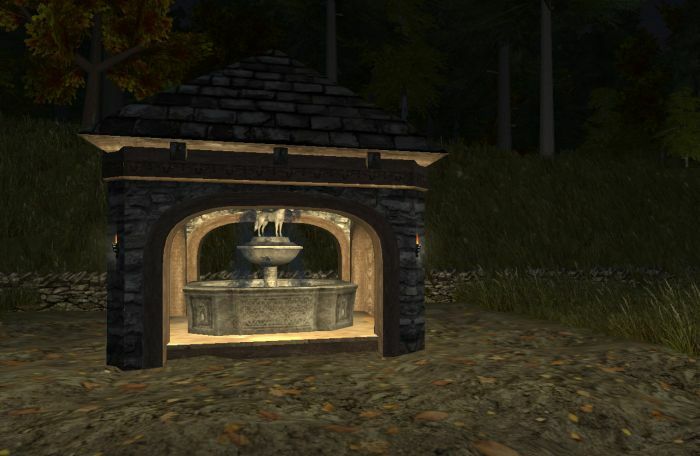 Hedge Mazes and Gazebos – Oh My #WurmOnline – Nomadic Gamers, eh! I’ve been spending some time working on my deed Mystic Cove, that’s the coastal deed on Deliverance. I tore down a bunch of horse pens that I had in the back after deciding that I didn’t want to breed a lot of animals there (I do horse breeding at Cirque instead) and took down an old wooden well I had, and placed this fancy new fountain. Then I created an arched 1×1 building over it, and ta-da, gazebo. I attached some torch lamps to the corners to light it up, and then proceeded to pave the surrounding area with a nice cobble path (in the screen shot above, it’s still dirt). I made a nice winding path around the gazebo and out the back gate, planted a willow bush and a few rose bushes, and I still have hopes of some time adding a small hedge maze in the area. The problem is hedges need 5 sprouts of the same tree per hedge, so that’s a lot of harvesting sprouts. I haven’t gotten around to it yet. In other news, I also finished the shipyard building that was on my dock. This was my first multi story project, and while it looks like nothing more than a square building 4 floors high with a 1×1 stone building on the very top surrounded by castle walls, I’m still quite pleased with it. Moumix has been busy with real life so there have been no ships built there in quite some time, but when I get the urge at least there’s a nice area completed. I’ve recently taken my 3rd character Faralithe over to the Independence server to “deed sit” for a friend who has been whisked away due to real life. She’s repairing bits and bobs that need looking after, while he’s getting ready to move. The deed is lovely and it’s a nice change of scenery when I spend most of my time these days on Deliverance. My next project is to collect the materials required to build a guard tower at Cirque, there’s a lot of wild animals that come visit up there, and Arysh doesn’t have the mighty 70 fight skill that Stargrace has, although she does have a very nice rare steel weapon. My masonry is about to hit 60 which is pretty nice, although not quite as useful as some other skills it does help to be able to improve forges, ovens, and stone altars to 70.